So many recipes to choose from on every holiday. 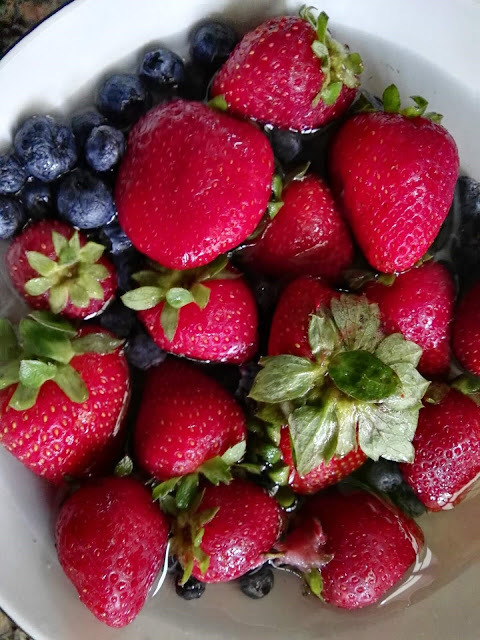 4th of July is dedicated to making foods red, white, and blue colored foods and drinks. Here are a few recipes you could use to enjoy your holiday! Add all the ingredients into a saucepan and cook over medium-low heat for two hours. Feel free to take out the pepper and use a non-alcoholic beer if you choose, this will make quite a bit of sauce if you need to cut ingredients in half. It is going to reduce a lot over time and even start to boil near the end. I left it at the same temperature the entire time stirring about every twenty minutes for the first hour, every ten the second hour, and every minute for the last ten minutes. After two hours pour the mixture into a food processor or blender and puree it. Then strain the sauce and enjoy! Use on chicken, pork, or beef. Next recipe is simple and delicious by yours truly. Grilled watermelon slices! Can be a savory/sweet side dish or a dessert. Slice a watermelon into triangles leaving the rind on. Brush the slices lightly with oil and place on the grill. Fruit cooks pretty quick on a grill, so cook each side for 2-3 minutes. Remove from grill and lightly salt and pepper each side to your taste liking. This is an amazing treat! Last lats talk dessert. Now there are too many recipes to write about. So I choose a cheese cake decorated with strawberries and blueberries. It is definitely red, white, and blue and amazing! I like the Jell-O no bake cheese cake mix, simple, easy and yummy. Follow recipe on box, let the cheese cake set and decorate with the berries. Make whichever design you like and enjoy an American colored dessert.